You can use jerk seasoning to marinate any kind of meat. The longer the meat sits in the marinade the better it tastes. If using fish marinate only for 15-20 minutes. For chicken I recommend a minimum of 4 hours. Serve the jerk chicken kebabs on lime cilantro rice. The addition of fresh herbs and lime zest really makes the rice aromatic and taste awesome. Add some seasonal grilled veggies flavored with mint and some grilled pineapple for that tropical feel. 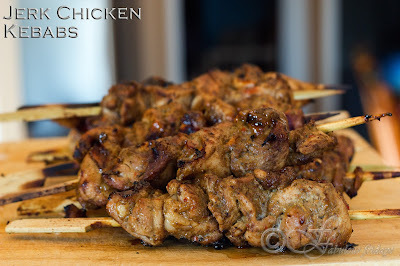 Cut the chicken thighs into small bite sized pieces and pour the marinade over them. Mix well and cover and refrigerate for a minimum of 4 hours. 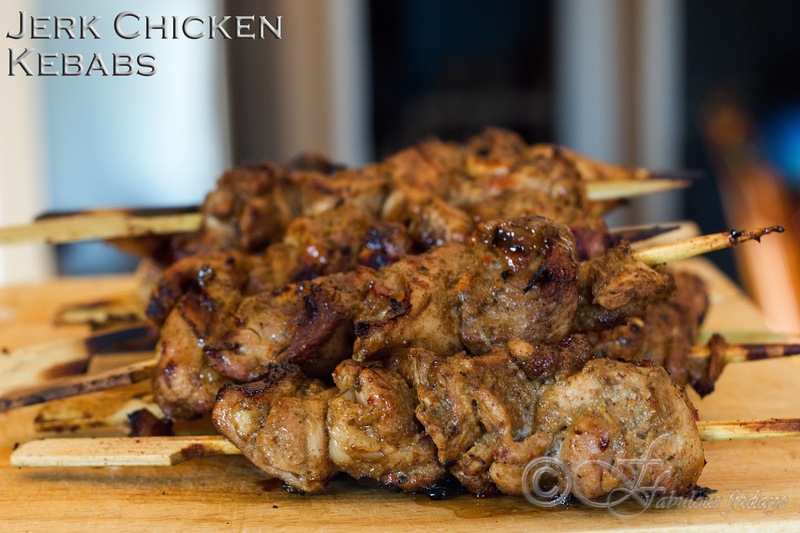 If you are using wooden skewers then soak them for an hour before threading the marinated chicken into them. Grill on medium high till all cooked through. 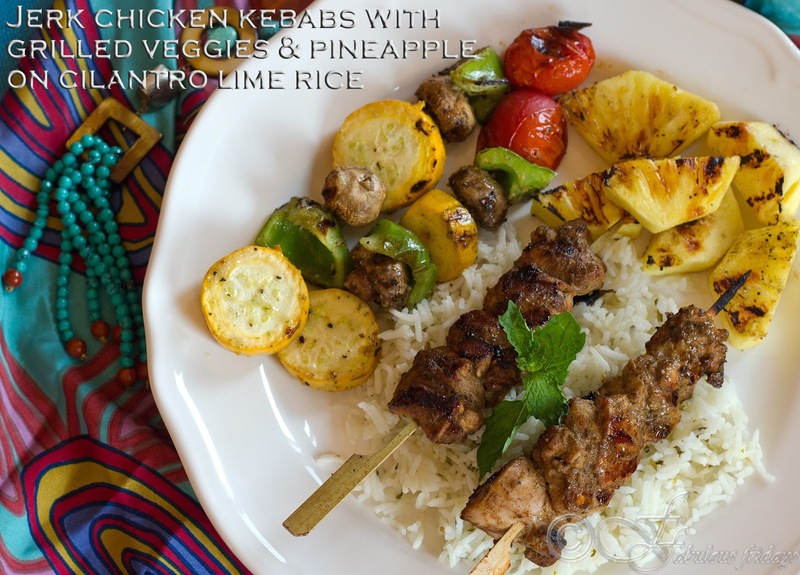 Serve hot over rice alongside grilled veggies and pineapple. Cut the veggies into chunky pieces. 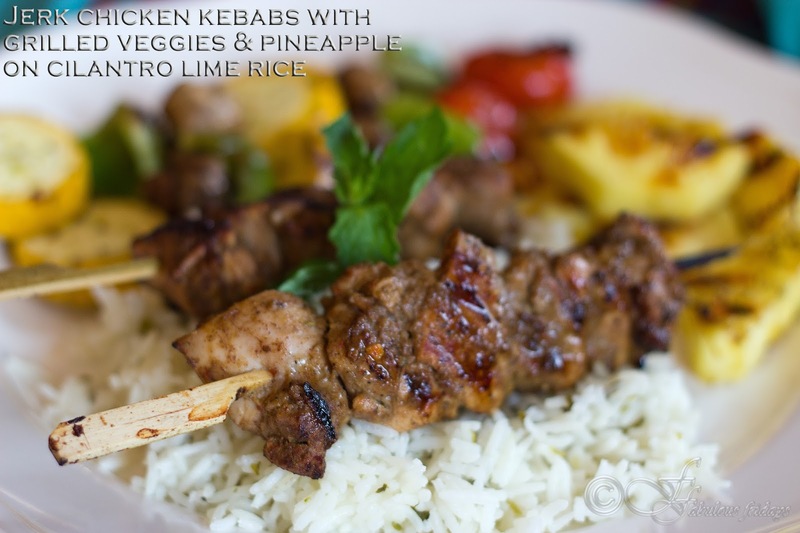 Marinate them in a concoction of olive oil, lemon juice, pinch salt and pepper, dry mint and dry oregano. Thread these on to the skewers and grill on high till tender crisp. 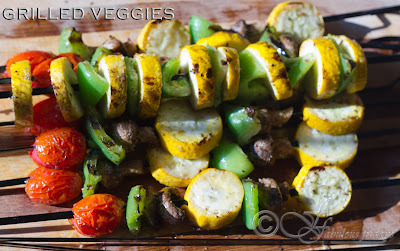 Grill chunky pineapple slices on the hot grill and serve alongside the vegetables. Place in a saucepan and add all the other ingredients. Stir to mix well. Cook till water comes to a rolling boil. Simmer and the cook covered for 7-10 minutes. Remove from heat and fluff up with a fork. Keep covered till ready to serve. Microwave method - Put all the ingredients in a large microwave safe dish. Make sure the dish is large enough so that the starchy liquid does not to boil over. Cook on high uncovered for 16-18 minutes. (These guidelines are for a 1000 watt Microwave, so cooking time can vary). Remove from heat and fluff up with a fork. Keep covered till ready to serve.